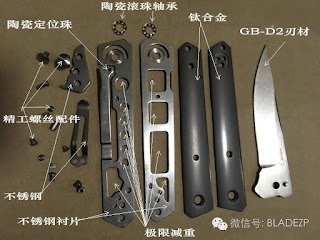 Best Chinese Knives: Boker + Kwaiken Style Update - High end CF and Titanium models are in! Boker + Kwaiken Style Update - High end CF and Titanium models are in! Ever since I saw, that the Chinese knife manufacturers released the replica of the Boker Lucas Burnley designed Kwaiken - I was waiting for the high end models, with upgraded materials to follow them. As in the recent times - the Chinese do not disappoint, and it was of course my good friend Ben from Ben's Shop, who delivered the goods! This model, doesn't only has the premium material choice - Titanium or Carbon Fiber (which is significantly lighter, but it also has milled steel liners, making it a lot lighter than the G10 version, and thus - better to carry.